Samsung has announced that it has commenced mass production of 10LPP (Low Power Plus) SoCs. The 10LPP parts are second generation 10nm FinFET SoCs from Samsung offering greater performance and / or power consumption qualities than its first gen 10LPE SoCs. Improvements delivered by Samsung's 10LPP SoCs can be varied, depending upon the choice of the device designer. For example, Samsung says that 10LPP SoCs can offer approx 10 per cent greater performance, or 15 per cent lower power consumption compared to its 10LPE (Low Power Early) parts. Presumably device designers could choose to strike a balance between these benefits too. Samsung says that it based the second generation 10LPP production pretty closely on its 10LPE process. Benefits delivered thanks to this methodology include "greatly reducing turn-around time from development to mass production and by providing significantly higher initial manufacturing yield," asserts the South Korean electronics giant. Ryan Lee, vice president of Foundry Marketing at Samsung Electronics, said "Samsung with its long-living 10nm process strategy will continue to work on the evolution of 10nm technology down to 8LPP to offer customers distinct competitive advantages for a wide range of applications." 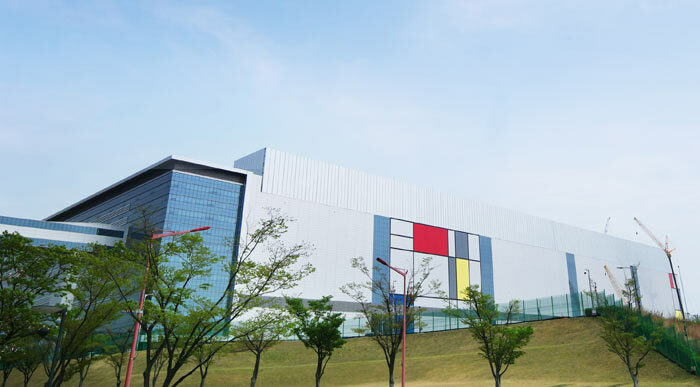 It was confirmed in the 10LPP mass production announcement press release that Samsung's newest manufacturing line, S3, located in Hwaseong, Korea (pictured above and below), is ready to ramp up production of process technologies including 10nm and below. Samsung's other fabs are the S1 in South Korea and S2 in Austin, Texas. Expect Samsung to further refine its 10nm process tech with the 10LPU (Low Power Ultimate) generation before 8nm and 7nm SoCs arrive. When might we see the first Samsung 10LPP SoC powered devices? Apparently we need only wait until "early next year" with volumes ramping up throughout 2018. It sounds like the new 10LPP processors will be ready just in time for the unveiling of the Samsung Galaxy S9 flagships, to coincide with either the CES 2018 (January) or MWC 2018 (in Feb/March).